Reach in your pocket or look in your tool bag, more than likely you will find a knife. Knives have been an essential tool for humans for thousands of years; its shape and size has evolved and changed multiple times, but its role and function has remained the same. A knife can be defined as a cutting instrument with one or more sharp-edged blades often pointed and set in a handle. Implements for cutting and slicing soft materials have been used by humans for hundreds of thousands of years. The early versions were made out of bone, antler, ivory and stone. In Pennsylvania, knives date to the Paleoindian period and were found at the Meadowcroft Rockshelter dating to 16,250 years ago. The jasper piece above was found in the Allentown area and its age is unknown. 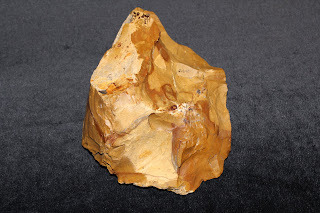 It is similar to Paleoindian artifacts that have been described as a meat processing tools. Stone knives such as these would have been placed in handles. The extra leverage provided by the handle vastly improved the cutting efficiency of these tools. Unfortunately the bone and wooden handles are rarely preserved in the archaeological record. The artifact below was recovered from the Sheep Rock Shelter. It is a carved deer rib handle. The stone blade was found in an adjacent five foot square and fits perfectly in the slot hollowed out of the wide end. The handle is highly polished and engraved on both sides. The engraving was done with stone tools and the polishing resulted from use. The engraved images were probably very important to the owner but we do not know their meaning. It is interesting that these are a combination of dots and lines and not the traditional zoomorphic or anthropomorphic images associated with Native Americans. There is a hole drilled at one end and a leather strap was probably used to carry the tool. Unfortunately, the age of this piece is unknown. The Sheep Rock Shelter knife essentially functioned as a pocket knife with a bone handle, which is a form similar to the one you likely possess. A 2008 market survey by the American Knife and Tool Institute (AKTI) reported that over 35 million households in the United States have pocket knives. Not unexpectedly, men possess sixty-eight percent of these knives. The traditional role of “man the hunter” has made this the essential tool for many men, long before they were old enough to assume the role as provider. A quick poll of staff found that most men had received their first pocket knife by the time they were seven and all fondly recall the experience. While men possess the greater percentage of knives, women have utilized knives for equally as long for food preparation and household chores. We have often discussed the role of archaeology in examining past human behavior to understand patterns of change over time. The changes that we see in knife forms reflect changes in society as well. The standard clasp knife has evolved into the “Swiss army knife” or the “pocket multi-tool” a tool with a bottle opener, screw driver, vise grips, cork screw, and the list goes on. 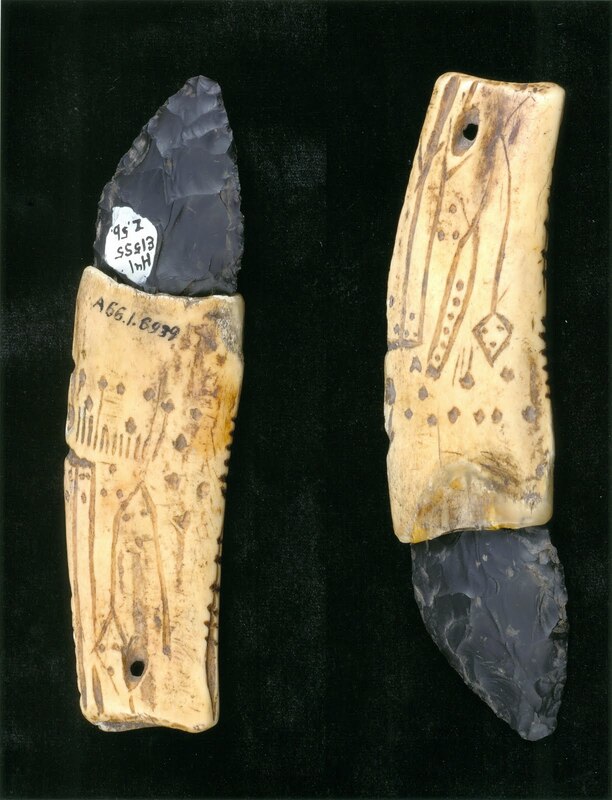 For archaeologists knives can function as a tool for dating the occupation of a site and the activities which occurred there. In our Native American knife examples the Paleoindian knife is a tool distinct to that period, where as the knife from Sheep Rock Shelter is a form that was used throughout multiple culture time periods. Their shape changed as their function evolved, in the same manner as blades and handles changed during the historic period. These clasp knives recovered from Conoy Town, a village site of the Conoy Indians in Lancaster County which dates from 1718 to 1743, are examples of pistol grip handles. This shape was replaced in the 1800’s losing the curve pistol shaped handle for a straighter handle. The development of spring blade knives in the 18th century was a significant advancement in the industry and provided the creation of the multi-tool knife. This little tool that you rely on for multiple tasks has served us well for thousands of years and will continue to evolve and change as our lifestyles change. "J" is for. . .
“J” is for jar, Jack’s Reef, Jamestown and this week “J” is for jasper. 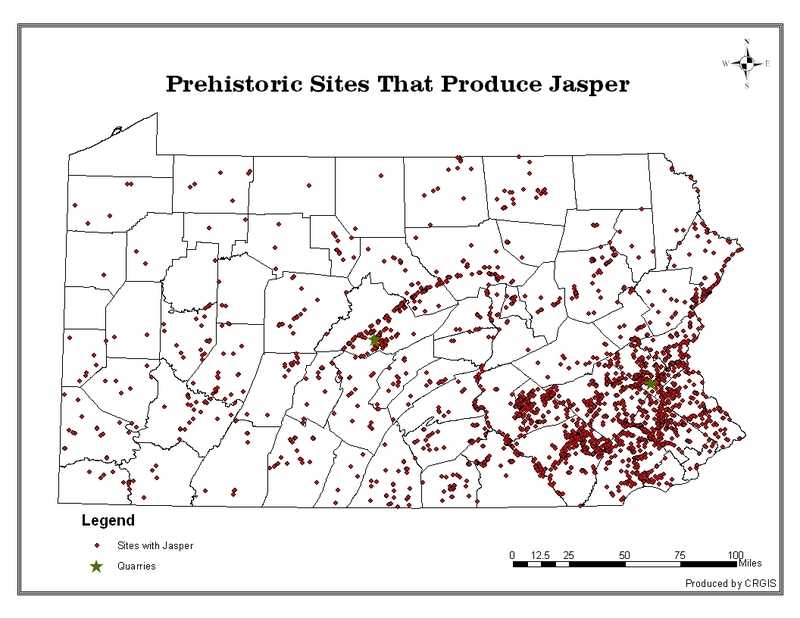 Pennsylvania jasper has been used to make stone tools for at least 11,000 years and was used by early Native Americans all over the East Coast, from New Brunswick to North Carolina. Jasper can be defined as a yellow, red or brown, cryptocrystalline or microcrystalline chert given its color by iron and other mineral inclusions. It can also be found in black or green. Its geologic origins are debated but it is most likely a sedimentary rock formed by the replacement of carbonates (limestone) by silica (quartz). Several major outcrops are found at the boundary between the silica rocks of Precambrian Blue Ridge province and the Cambrian/Ordovician rocks of the Valley and Ridge province. There are two major quarry formations in Pennsylvania. The Bald Eagle/Houserville quarries near State College and the Hardyston (Reading Prong) quarries south and west of Allentown. Major sources in adjacent states are the Iron Hill quarries in Delaware along the Pennsylvania line and the Flint Run quarries in the Shenandoah valley of northern Virginia. Jasper was desirable as a toolstone because it is available in very large blocks (the package size), thus there are no restrictions on the size of artifacts that could be produced; it is available in very large quantities; thus it could be used in trade; and it has a fine (microcrystalline), glass-like structure; allowing for highly controlled (predictable) flaking techniques. The disadvantage is that it sometimes contains voids and impurities which require testing at the quarry to reduce the probability of bringing home a poor quality piece. The Bald Eagle/Houserville quarries are concentrated in the State College area and the raw material seems to have been collected from the ground surface without much effort. However, much of this source is course in texture and it does not seem to have been used over an area outside of central Pennsylvania. The Hardyston jasper quarries consist of a series of major outcrops that extend over an area of 25 miles. Henry Chapman Mercer mapped over twenty separate quarries in the 1890s. This formation is arguably the best quality lithic material in the Middle Atlantic region. Large pits were dug to extract it from the decaying bedrock. Mercer reported pits over 50 feet in depth. Excavations by the Pennsylvania Historical and Museum Commission documented depths of up to 24 feet and 80 feet across. Jasper has been used throughout prehistory. 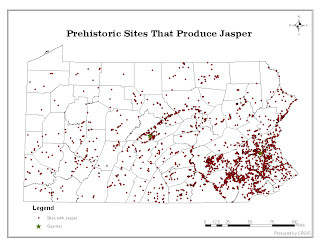 Its widest distribution was during Paleoindian times when Pennsylvania jasper was carried to sites in Maine. It continued to be a preferred material during the Early Archaic period but during the Middle and Late Archaic it witnessed a decrease in use. Its most intensive use was during the Transitional period when it was traded throughout the Middle Atlantic region. It is strongly associated with Lehigh and Perkiomen broadspears and fishtail projectile points. During early Late Woodland times it was the preferred stone for the production of Jack’s Reef projectile points (see above, top center). These are finely made and very thin and may have been the first tips used with the bow and arrow. Archaeologists trace the movements of prehistoric groups and patterns of trade and exchange by tracing how far lithics have moved from a given source. There are a variety of techniques such as chemical characterization as determined by neutron activation, atomic absorption and flame emission spectrophotometry, or X-ray fluorescence. Very simply stated, these methods determine the precise chemical composition of the different quarries (especially focusing on rare elements) and match artifacts to these chemical compositions. These methods have documented a Middle Archaic artifact found in central New Jersey as having originated in the Flint Run quarries in Virginia and a Paleoindian artifact from Maine originating in the Hardyston quarries. It has taken over 20 years to perfect these methods but they hold promise of making significant contributions to our understanding of past migrations and trading patterns. 2008 Expanding the Geochemical Database for Virginia Jasper Sources. Journal of Middle Atlantic Archaeology 24: 57-78. H is for Historical Archaeology. Archaeology is the study of past human behavior through the systematic recovery and analysis of material remains or objects. A basic division in the study of past human behavior is the difference between historic and prehistoric archaeology. Historical archaeologist study the remains of cultures for which a written record exists, while prehistoric archaeologists examine cultures for which we have no written record. Archaeology is a scientific process of careful excavation and recovery of the archaeological record. This record may be represented in multiple ways to include, soil changes, structural remains, or material remains. 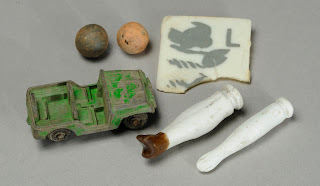 These material remains or objects recovered are referred to as artifacts. 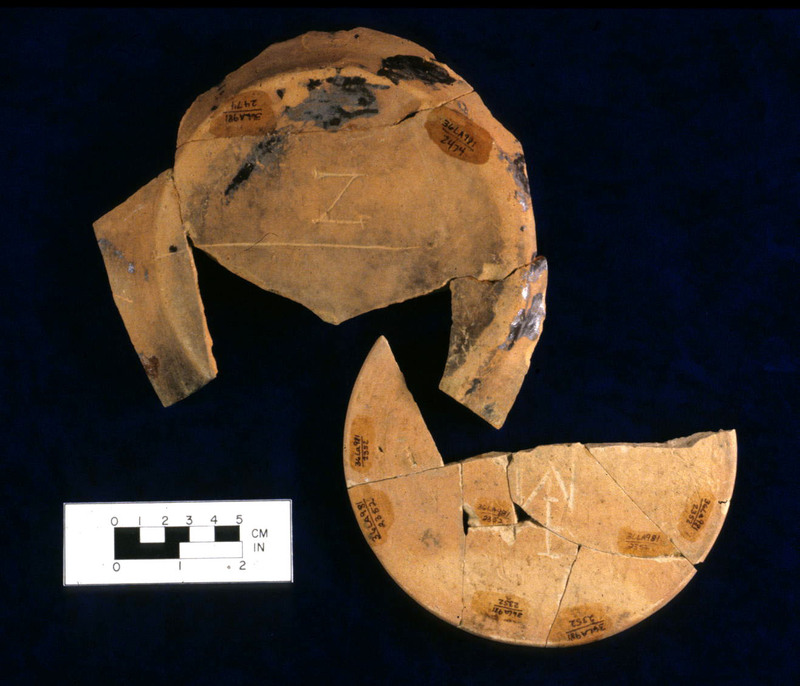 Redware pottery fragments recovered from Ephrata Cloister. Located in Lancaster County, this historic porperty was an 18th century religious communal society founded in 1735 by Conrad Beissel. Members were expected to take vows of celibacy, poverty, and obedience, and personal possessions were not permitted. These bottom of these redware vessels were scratched with initials, indicating individual possession was practiced by some members against communal rules. The analysis of artifacts recovered from archaeological sites enable archaeologists to create a picture of every day life for cultures and peoples that history often ignores in the historic record. Frequently there is a difference between what is written and what people actually do in their daily lives. You might know who your great grandparents were, but do you know what they did with their garbage, how they planted their garden, what dishes they ate from, if they took in boarders or had servants, how they celebrated their culture and heritage? Perhaps you have a family history that identifies certain aspects of their lives, but often these documents are biased by the writers’ personal beliefs. Archaeology has the unique task of providing a more objective account of our past and providing a more complete picture of our cultural heritage. In our own excavations conducted at Fort Hunter the analysis of dietary waste from a hearth feature that we interpret as a bake oven has provided a clearer picture of the diet of soldiers at this provincial fort. Examination of the faunal remains reveals that the meats consumed were from cow, pig, sheep, horse, deer, turtle and fish. Beef represented the greatest percentage of consumed meats, while small game such as turkey or rabbit are absent from the record. Historic documents of the period list provisions for the troops, but it does not indicate how the meats were to be preserved or prepared for transport across the rough terrain. Analysis of the faunal remains from Fort Hunter indicated that the beef was likely salted and cured prior to transport, based on the low number of butchered bones recovered. It also indicates that soldiers were not hunting wild game in the woods surrounding the fort to supplement their meager rations. Bones demonstrated spiral fracturing commonly seen in bones cracked to extract the marrow. Marrow was likely consumed and the bones then boiled for soups. All of this paints a dismal picture of the diet of these soldiers and a more complete story of their daily life. When we examine our past, we are looking at our cultural heritage. Our cultural heritage is important to most of us as it helps to define our values and identifies who we are. Recent archaeological investigations at historic sites have provided additional information on the heritage of pioneers, immigrants, slaves and Native Americans. Children who are not well represented in the historic record are now documented thru the artifacts recovered at these sites. All of these groups are underrepresented in the historic record and archaeology can provide a picture of everyday life for them. Children are often not included in the historic record. These artifacts represent the cultural material from working class families at Eckley Miner's village in Luzerne County. We all benefit from examining our past and preserving our material culture for future generations. This focus on human behavior and artifacts is what differentiates archaeology from history. History examines the events, but it does not make the connection to a person or event through personal objects. By examining our cultural heritage, we can better understand changes in society and hopefully develop better plans for dealing with cultural change in the future. In closing, H is for historical archaeology but more importantly H is for heritage and the preservation of our culture.